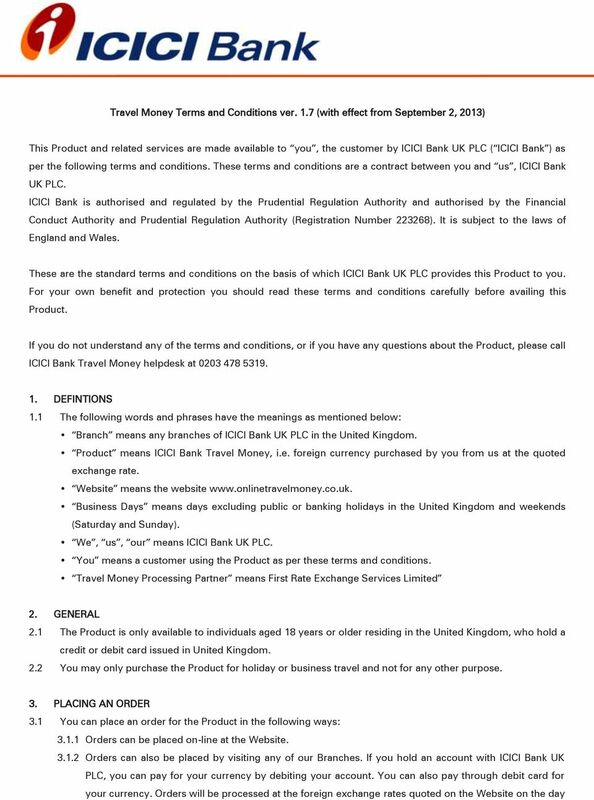 Download "Travel Money Terms and Conditions ver. 1.7 (with effect from September 2, 2013)"
2 of ordering. 3.2 Orders placed will be rounded up to the nearest currency note/cheque denomination. Currency availability is subject to all applicable laws and regulations, including monetary limits, currency exchange restrictions and anti-money laundering regulations. 3.3 When placing an order you declare and represent that the information provided by you is true and accurate and that you will not withhold any information from us. We may call you and request further information should it be reasonably required. A valid landline home telephone number is required for home delivery. 3.4 ICICI Bank UK PLC is responsible for the processing of your order. Decisions related to acceptance and approval of your order will be solely taken by ICICI Bank UK PLC. 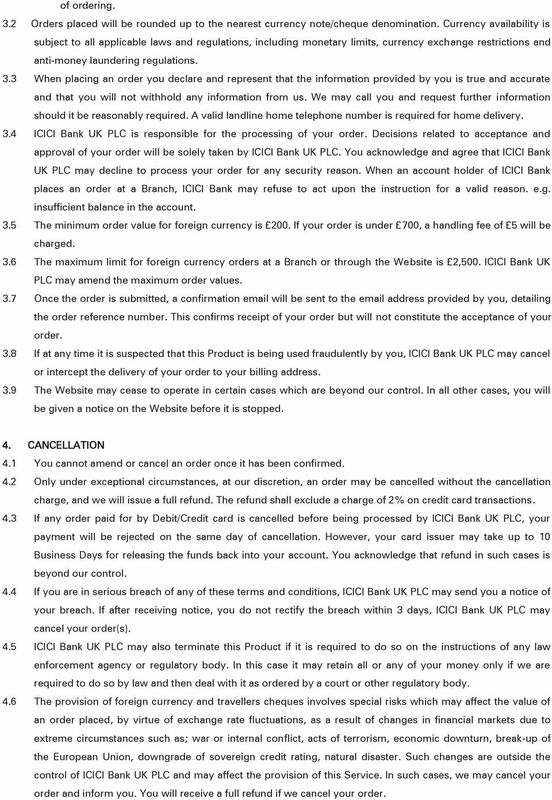 You acknowledge and agree that ICICI Bank UK PLC may decline to process your order for any security reason. When an account holder of ICICI Bank places an order at a Branch, ICICI Bank may refuse to act upon the instruction for a valid reason. e.g. insufficient balance in the account. 3.5 The minimum order value for foreign currency is 200. If your order is under 700, a handling fee of 5 will be charged. 3.6 The maximum limit for foreign currency orders at a Branch or through the Website is 2,500. ICICI Bank UK PLC may amend the maximum order values. 3.7 Once the order is submitted, a confirmation will be sent to the address provided by you, detailing the order reference number. This confirms receipt of your order but will not constitute the acceptance of your order. 3.8 If at any time it is suspected that this Product is being used fraudulently by you, ICICI Bank UK PLC may cancel or intercept the delivery of your order to your billing address. 3.9 The Website may cease to operate in certain cases which are beyond our control. In all other cases, you will be given a notice on the Website before it is stopped. 4. CANCELLATION 4.1 You cannot amend or cancel an order once it has been confirmed. 4.2 Only under exceptional circumstances, at our discretion, an order may be cancelled without the cancellation charge, and we will issue a full refund. The refund shall exclude a charge of 2% on credit card transactions. 4.3 If any order paid for by Debit/Credit card is cancelled before being processed by ICICI Bank UK PLC, your payment will be rejected on the same day of cancellation. However, your card issuer may take up to 10 Business Days for releasing the funds back into your account. You acknowledge that refund in such cases is beyond our control. 4.4 If you are in serious breach of any of these terms and conditions, ICICI Bank UK PLC may send you a notice of your breach. 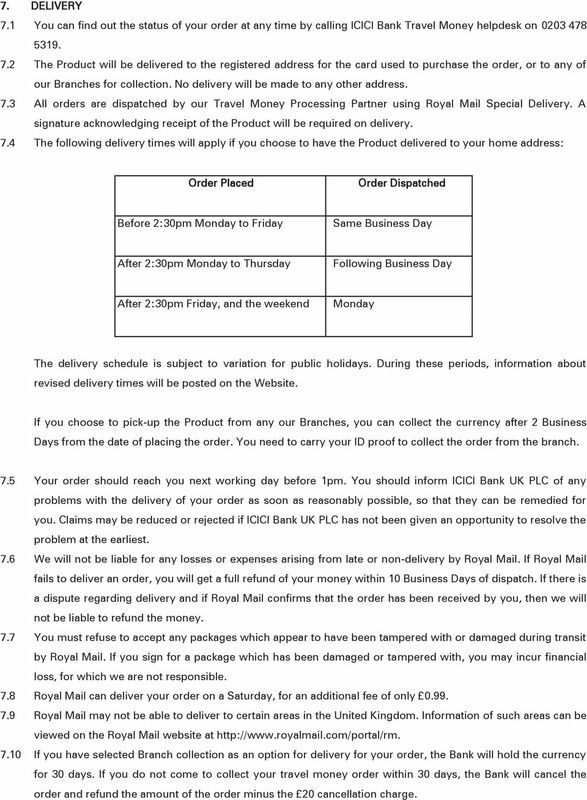 If after receiving notice, you do not rectify the breach within 3 days, ICICI Bank UK PLC may cancel your order(s). 4.5 ICICI Bank UK PLC may also terminate this Product if it is required to do so on the instructions of any law enforcement agency or regulatory body. In this case it may retain all or any of your money only if we are required to do so by law and then deal with it as ordered by a court or other regulatory body. 4.6 The provision of foreign currency and travellers cheques involves special risks which may affect the value of an order placed, by virtue of exchange rate fluctuations, as a result of changes in financial markets due to extreme circumstances such as; war or internal conflict, acts of terrorism, economic downturn, break-up of the European Union, downgrade of sovereign credit rating, natural disaster. Such changes are outside the control of ICICI Bank UK PLC and may affect the provision of this Service. In such cases, we may cancel your order and inform you. You will receive a full refund if we cancel your order. 3 4.7 Holiday Cancellation Refund: In case of cancellation of your holiday or business trip, within 30 days of placing the order, you will get a refund of your payment to ICICI Bank UK PLC by informing ICICI Bank about the cancellation by sending an to Full refund will be given where a holiday has been cancelled due to industrial actions, natural disasters, advisory notice from the Foreign Office not to travel, a health alert in the country of destination. Other reasons may be considered by ICICI Bank UK PLC. Refunds will be made at the same exchange rate as given at the time of purchase ICICI Bank UK PLC will acknowledge the receipt of your . You must return the Product to ICICI Bank UK PLC with proof of cancellation of your trip, at the address informed to you. A special delivery envelope will be sent to you by our Travel Money Processing Partner asking you to return the currency Your payment will be refunded to you by ICICI Bank UK PLC within 5 business days of receipt of the Product and the proof of cancellation of your trip. 4.8 If you find a difference in the order i.e. incorrect amount or currency compared to the Travel Money currency ordered by you, please contact our Customer Service Team within one day of receipt of the order. Our Travel Money Processing Partner may contact you for further details on your order. 5. CHARGES 5.1 ICICI Bank UK PLC does not charge any fees if your order is over 700. However, if paying by credit card, you will have to pay an additional fee of 2% of the order value. There are no additional charges when paying by debit card or if the payment is through ICICI Bank UK PLC bank account. 6. PAYMENT 6.1 When making payment you represent that you are acting on your own behalf, for a lawful reason. You represent that the funds used to purchase this Product are legally and beneficially yours. 6.2 There are a number of payment options: By Credit or Debit Card: You can pay for your order using credit or debit cards issued in the United Kingdom (except ICICI Bank Debit Card), namely Maestro, Visa or MasterCard. You undertake that you have provided the correct details, the credit or debit card is your own and that the billing address of your card matches the delivery address of your order. ICICI Bank UK PLC does not accept business cards for payment for any order(s) By ICICI Bank Account Transfer (Only available for orders placed in Branch): If you have an account with ICICI Bank UK PLC, you can choose to visit any of our Branches and pay for your order using your account. Once you have placed your order with ICICI Bank UK PLC, funds will be debited from your account. 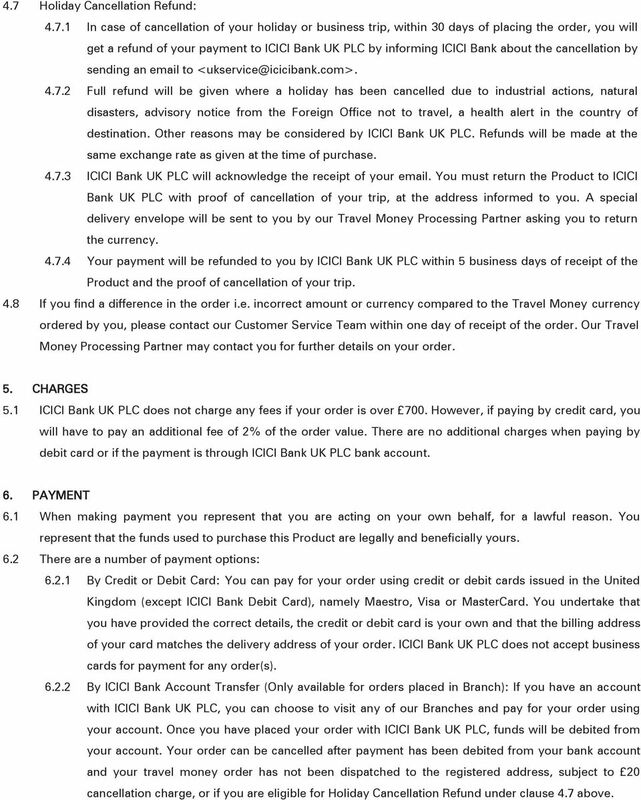 Your order can be cancelled after payment has been debited from your bank account and your travel money order has not been dispatched to the registered address, subject to 20 cancellation charge, or if you are eligible for Holiday Cancellation Refund under clause 4.7 above. 4 7. DELIVERY 7.1 You can find out the status of your order at any time by calling ICICI Bank Travel Money helpdesk on The Product will be delivered to the registered address for the card used to purchase the order, or to any of our Branches for collection. No delivery will be made to any other address. 7.3 All orders are dispatched by our Travel Money Processing Partner using Royal Mail Special Delivery. A signature acknowledging receipt of the Product will be required on delivery. 7.4 The following delivery times will apply if you choose to have the Product delivered to your home address: Order Placed Order Dispatched Before 2:30pm Monday to Friday Same Business Day After 2:30pm Monday to Thursday Following Business Day After 2:30pm Friday, and the weekend Monday The delivery schedule is subject to variation for public holidays. During these periods, information about revised delivery times will be posted on the Website. If you choose to pick-up the Product from any our Branches, you can collect the currency after 2 Business Days from the date of placing the order. You need to carry your ID proof to collect the order from the branch. 7.5 Your order should reach you next working day before 1pm. You should inform ICICI Bank UK PLC of any problems with the delivery of your order as soon as reasonably possible, so that they can be remedied for you. Claims may be reduced or rejected if ICICI Bank UK PLC has not been given an opportunity to resolve the problem at the earliest. 7.6 We will not be liable for any losses or expenses arising from late or non-delivery by Royal Mail. If Royal Mail fails to deliver an order, you will get a full refund of your money within 10 Business Days of dispatch. If there is a dispute regarding delivery and if Royal Mail confirms that the order has been received by you, then we will not be liable to refund the money. 7.7 You must refuse to accept any packages which appear to have been tampered with or damaged during transit by Royal Mail. If you sign for a package which has been damaged or tampered with, you may incur financial loss, for which we are not responsible. 7.8 Royal Mail can deliver your order on a Saturday, for an additional fee of only Royal Mail may not be able to deliver to certain areas in the United Kingdom. Information of such areas can be viewed on the Royal Mail website at If you have selected Branch collection as an option for delivery for your order, the Bank will hold the currency for 30 days. If you do not come to collect your travel money order within 30 days, the Bank will cancel the order and refund the amount of the order minus the 20 cancellation charge. 5 8. SERVICE ASSURANCE 8.1 Once we have checked your identity and received your payment and if we fail to dispatch your order within the stated time, as per Clause 7.4, we will send you 5 compensation. This assurance excludes any delays caused by Royal Mail, as per their terms and conditions. 9. IMPORT AND EXPORT REGULATIONS 9.1 You must independently check the relevant currency restrictions applicable in different countries. 10. COMPLAINTS 10.1 If you experience problems with the delivery or any other aspects of your order, you should approach ICICI Bank UK PLC with your complaints. ICICI Bank UK PLC is responsible for dealing with all your complaints and queries To register a complaint, you may call If you would like to make a written complaint, write to: ICICI Bank UK PLC. 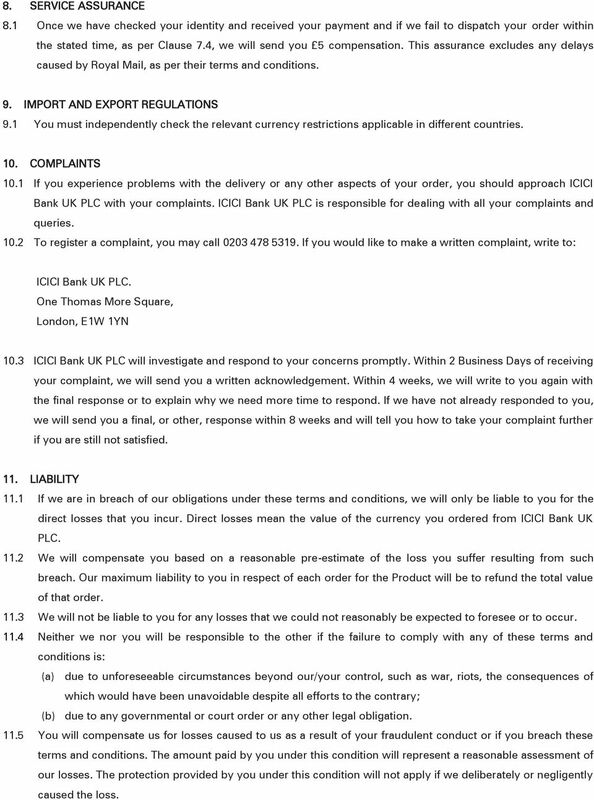 One Thomas More Square, London, E1W 1YN 10.3 ICICI Bank UK PLC will investigate and respond to your concerns promptly. Within 2 Business Days of receiving your complaint, we will send you a written acknowledgement. Within 4 weeks, we will write to you again with the final response or to explain why we need more time to respond. If we have not already responded to you, we will send you a final, or other, response within 8 weeks and will tell you how to take your complaint further if you are still not satisfied. 11. LIABILITY 11.1 If we are in breach of our obligations under these terms and conditions, we will only be liable to you for the direct losses that you incur. Direct losses mean the value of the currency you ordered from ICICI Bank UK PLC We will compensate you based on a reasonable pre-estimate of the loss you suffer resulting from such breach. Our maximum liability to you in respect of each order for the Product will be to refund the total value of that order We will not be liable to you for any losses that we could not reasonably be expected to foresee or to occur Neither we nor you will be responsible to the other if the failure to comply with any of these terms and conditions is: (a) due to unforeseeable circumstances beyond our/your control, such as war, riots, the consequences of which would have been unavoidable despite all efforts to the contrary; (b) due to any governmental or court order or any other legal obligation You will compensate us for losses caused to us as a result of your fraudulent conduct or if you breach these terms and conditions. The amount paid by you under this condition will represent a reasonable assessment of our losses. The protection provided by you under this condition will not apply if we deliberately or negligently caused the loss. DIRECT DEBIT REQUEST - NEW CUSTOMER Business: Kidz Kingdom Childcare Centre ABN/ACN: 46092385343 Customer Reference: *Surname: *First Name: Mobile Phone: *Email: *Address: * indicates a mandatory field. MyNetCard Visa Card Terms and Conditions MYNETCARD VISA CARD TERMS AND CONDITIONS OF USE Please read these terms and conditions (the "Terms and Conditions") carefully and keep a copy for your records.